Brendan Ingle MBE with Edwin Cleary. 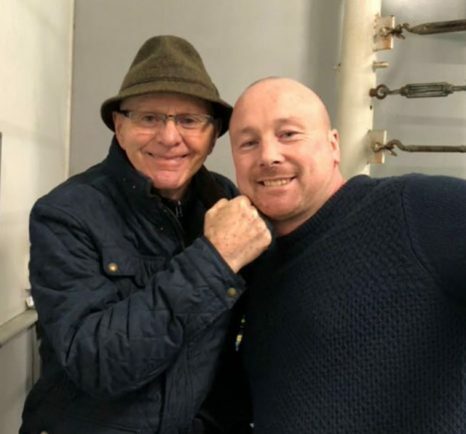 LEAMINGTON’S Edwin Cleary said he felt blessed to have spent time with boxing legend Brendan Ingle MBE, the man who inspired him to launch Cleary’s Boxing Gym. Dublin-born Ingle passed away last Friday and his legacy left on the sport will always be remembered. With 19 wins and 14 defeats in his professional career, Ingle took up coaching at his Sheffield gym where Johnny Nelson, Naseem Hamed, Junior Witter and Kell Brook all went on to lift world titles. Ingle was also Edwin’s coach and the Cleary’s Boxing Gym owner spoke openly about the man he first met in September 1996. “I was looking to turn professional and I was to meet Brendan at 10am for a trial but I turned up early because I wanted to set a good example,” he said. “The gym was closed so I went to his house. I knocked at his door and Brendan asked who I was. “He gave me the keys to open up and as I walked to gym I thought how trustworthy Brendan was because I could have been anyone. Edwin was given life lessons in boxing by Brendan before being told how the lines on the floor were used to coach his boxers. Once the gym was full Edwin was told to get into the ring and was asked to do the strangest of things. “He asked me to sing,” said Edwin. “Shocked and flustered my mind went blank as I’d only been there five minutes and didn’t know anyone. “Brendan told me again to sing so I sang the ‘I Can Sing A Rainbow’ nursery rhyme. Brendan’s message was adults were afraid to try new things and make mistakes because they might look silly. Being forced to sing in front of a full boxing gym was to inspire Edwin to never worry about trying something new. Edwin went on to spend four years under the guidance of Brendan, an experience he will never forget. “What Brendan taught me you can’t learn from a coaching course or book,” added Edwin. “If I could be half as successful as him I’ll be the happiest coach in the world. “Brendan will be remembered for creating dozens of champions but he would tell you the thousands of children whose lives he changed was what made him happiest.